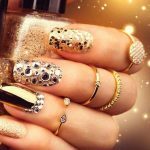 Nail Art Stickers – Which Ones Are Worthy of Being Included in Your Manicure Kit? Stickers are a great way of increasing your nail art repertoire, but with so many on the market, it’s hard to tell which ones are the best of the bunch. However, it helps if you know how to apply them first. Make sure your nails are clean and dry before applying stickers. If your natural nails are not completely dry, the sticker could fail to adhere properly. Make sure any polish is completely cured too. Use tweezers to lift and position your chosen stickers from their backing sheet. Don’t touch the sticky side of the sticker with fingers as it reduces the adhesiveness. Place the stickers gently on your nails, and only when you are happy with their position, press down. A better finish can be achieved by using the appropriate silicone sticker tool to do this. Using the same tool, smooth from the centre to the edges when you are pressing your stickers down, removing any air bubbles. Trim the applied sticker if necessary, making sure it fits perfectly, following your nail shape. Apply at least two coats of a sealer, or top coat. This not only adds to the security of your stickers, but also smooths out the edges and increases longevity. Now we know the bset way to apply them, I’m going to take a look at the most popular stickers. This is a very busy pack of stickers, with something to suit every taste, and then some. They stick well, and being so thin, leave no tell tale lines once a topcoat has been applied. These don’t seem to adhere as well to natural nails, so are best for gel or acrylic nails. If you want a huge variety of stickers for constantly changing your look, these are awesome. Contained in little pots, these rolls of stickers and foils allow you to cut out all sorts of sparkly shapes and patterns to create unique nail designs. The sticky back is just sticky enough to stick where you want, and not where you don’t. I really like these. This is definitely a job for tweezers and tiny scissors, as they can be very fiddly for fingers. If you want to design your own customized stickers, this set of stunningly shiny rolls is just perfect for you! I’ve fallen in love with these perfect tiny dried flowers – they are absolutely gorgeous! Containing different colors and types of flowers, I’m including them in all my nail designs. My only complaint is that, although there are plenty in the pots, I keep having to order more! Unique, unusual, beautiful - what more can I say! Once in situ, these stay stuck for ages, even without a topcoat. A base material of very durable PVC makes releasing them from the backing and placing without any damage, really easy. These stickers work best with either gel or acrylic nails – it would be nice if they adhered this well to natural nails. For hard-to-damage stickers in a large variety of designs, these are well worth considering. 50 sheets of the 3D design nail art stickers in one set will be sold together by random color and pattern. My initial thoughts were that these looked a little dull compared to all the vibrantly bright stickers I’d been trying out, but once I looked closer, I couldn’t help but be impressed. The geometric designs contained in this pack can either be left as stickers on your painted nails, but also used as a guide for where to paint any given design – painting the polish within the lines. Like several other brands, these could be improved if they stuck to natural nails as well as they do to artificial ones. This multi-use pack produces excellent results, contains plenty of unique designs, and is very budget friendly.